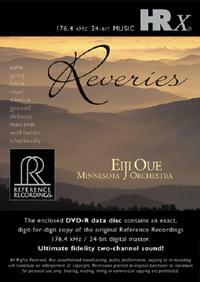 Relaxing, beloved classics by Debussy, Satie, Ravel, Faure, Tchaikovsky, Sibelius and more, beautifully played by one of America's great orchestras. A balm for jangled nerves, and excellent music for unwinding and dining! The pace of the human heartbeat so appealed to the composers on this program that they harnessed their music to it. Yet they produced orchestral statements of such variety that a listener might not immediately discern their similar pace, which is described by the musical term "andante," or walking tempo. A departure, then, for RR and "Prof." Johnson, whose spacious and transparent sonic textures play large dividends in string-based orchestral music of such clarity and refinement.